The Dhaka Medical College Hospital (DMCH) is the largest public hospital in the country. For those who cannot afford the high fees of private hospitals or clinics, the DMCH is the only hope for getting cured. In the event of an emergency, it is often the only option. Even patients from far-off places in the country come all the way to DMCH in the absence of beds or proper medical treatment in their own districts. 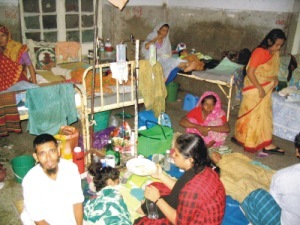 But in spite of its crucial role in our ailing health care system, the DMCH is a house of endless horror stories. Rampant corruption, years of unhindered politicisation of the entire institution and an unrealistically poor budget have turned DMCH into a hellhole for the sick.